The specialty of allergy, asthma and immunology combines my passion for science and research with my desire to ease the suffering of my patients. I have also had allergy treatment in the past that worked very well for me, so I've experienced firsthand what specialized allergy care can do. Allergies and asthma can have so many different symptoms, and patients don't always have a 'textbook' problem. That's why experience is so important. Knowing what to look for, putting together all the pieces of a puzzle - symptoms, medical history, lifestyle - helps me get an accurate diagnosis and the most effective treatment for you. Giving you the right treatment starts with a very simple but vitally important activity: listening. While I use state-of-the-art tests and procedures, I still believe that you are the best source of information about your own health. Taking the time to listen and understand you is crucial to giving you the best care, and it's also one of the best parts of what I do. I enjoy talking with you, getting to know about you and your life and keeping you involved in your care. We'll work together to make sure you get the results you need. Dr. Bagg has been recognized as one of "America's Top Physicians" for the past four years. He gives presentations to local medical training programs and for the American Lung Association. He is also involved in clinical research and is currently conducting clinical studies with medical students from UCF as an Associate Professor at the College of Medicine. He has published his research findings over 20 times and has presented his research at the World Allergy Organization meeting in Thailand. Colleagues have elected Dr. Bagg to be the future president of the Florida Allergy, Asthma and Immunology Society. 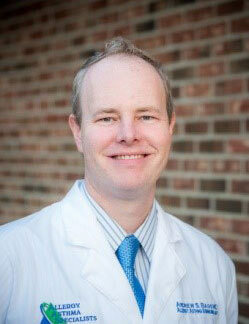 For the past 2 years, Dr. Bagg was named one of the "Best Doctors in America" in the field of Allergy and Immunology.